Sale ends May 30, 2019! Each green fee vouchers are good for one 18-hole round of golf any time during the 2019 season, cart and include full use of our extensive practice facilities. 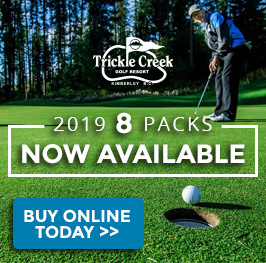 There are no date or time restrictions on when you can use your vouchers; just call the course, book a tee time and enjoy all that Trickle Creek has to offer. It’s the perfect way to spend a day with friends, clients or reward your employees for their hard work! This offer is only available online. Unlimited play for the week. During the off season 2019 Locals 5 & 10 Round Value Packs can be purchased through the Kimberley Alpine Resort Guest Services desk located at the base in the Polaris Lodge. Locals 10 Round Value Pack! *Must show valid ID (Hydro bill or proof of residence at time of purchase, only available through the pro shop). 7 day advanced tee time bookings. Locals 5 Round Value Pack! *At time of purchase, must show valid ID (Hydro bill or proof of residence at time of purchase, only available through the pro shop or Kimberley Alpine Resort Guest Services).